The Nassau grouper, a commercially valuable reef fish found in the Caribbean, is now listed as critically endangered by the IUCN. Nassau groupers migrate yearly to breed at massive gatherings known as spawning aggregations, where they are an easy target for fishers. Fisheries management officials say they often lack the resources to enforce fishing regulations, leaving the Nassau grouper’s spawning aggregations vulnerable to illegal harvest in Belize and throughout the region. In 1975, famed explorer and conservationist Jacques Cousteau traveled aboard his boat, the Calypso, in hopes of documenting one of nature’s most impressive underwater gatherings: the spawning of the Nassau grouper (Epinephelus striatus), a large predatory fish rumored to aggregate in the tens of thousands. But an aerial shot from the documentary series “The Undersea World of Jacques Cousteau” also reveals fishing boats moored by the dozens in the impossibly blue waters of Belize’s Caye Glory Atoll; they, too, were there for the fish. “Now, with the introduction of the outboard motor,” Cousteau says in the voiceover, “we wonder how many more years the grouper can support these fishermen.” Cousteau’s words have proved prophetic; according to a recent IUCN report, the Nassau grouper is now classified as critically endangered. 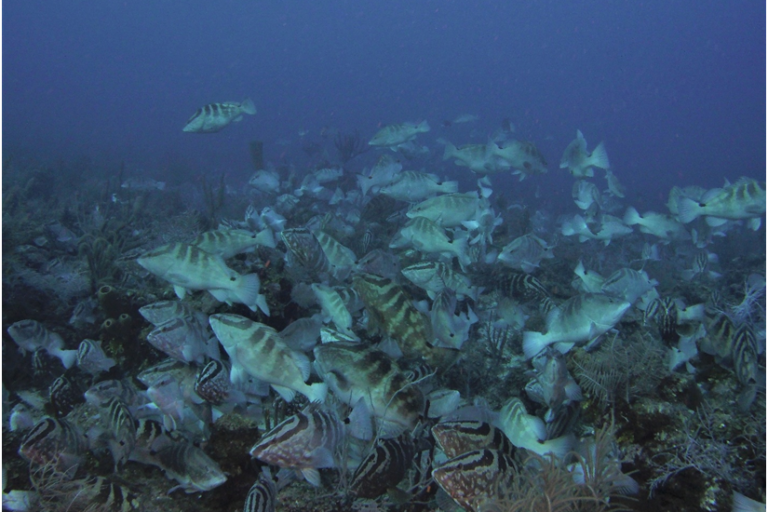 A spawning aggregation of Nassau groupers. Image by Alexander Tewfik for WCS. Today, the boats dotting the seas above the spawning aggregations are largely gone, banned from exploiting the gatherings by regulations designed to save the fishery. But under the water, most of the fish are gone too. The IUCN estimates that total Nassau grouper populations have dropped by more than 60 percent since 1980. The numbers will likely continue to plummet without further regulations and, perhaps even more importantly, effective enforcement, according to researchers and conservation officials. Like any other animal, the Nassau grouper pays little attention to political boundaries, and can be found in the waters of 40 countries throughout the Caribbean, including a few strongholds in Belize. The marine monitoring team for the Wildlife Conservation Society (WCS) Belize sighted illegal fishers during this year’s breeding season at Northeast Point in Glover’s Reef Marine Preserve, a known and closely monitored spawning aggregation site. Once spotted, the crew aboard the illicit craft dumped ice and gear, even cutting the ship’s anchor to make a quick getaway. The vessel fled to the southeast, away from the atoll. “Our survey team was angry,” says Alexander Tewfik, senior conservation scientist for WCS Belize, “given the critical status of the species and intrusion into a fully protected site and the sovereign waters of Belize.” They were also “apprehensive,” according to Tewfik, fearing that the illegal fishers might be armed. From December through March, the Belize fishery is closed to allow adults to safely migrate from their home reefs to the outer reef drop-offs where they congregate yearly to breed. Fishing is prohibited at Belizean spawning aggregation sites. Still, in Belize, as in most countries with Nassau grouper populations, fishing remains legal for individuals of certain sizes from April through November. In spite of strict protections surrounding known breeding areas, the reliability with which these fish migrate to their spawning grounds makes them easy targets for illegal fishing vessels — the open-water equivalent of shooting fish in a barrel. Of the 50 known spawning aggregations, more than 30 have disappeared entirely, making the aggregation at Glover’s Reef Marine Reserve especially vital. 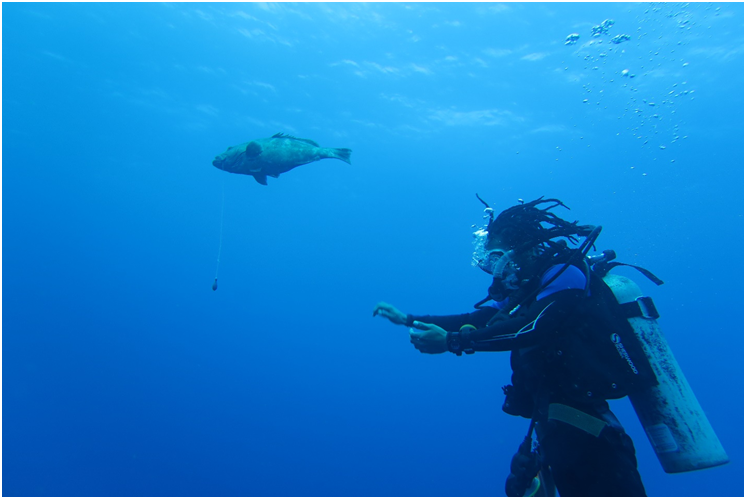 An illegally hooked Nassau grouper sits suspended in the water alongside a monitoring diver at Northeast Point, Glover Atoll’s spawning aggregation site, in 2015. Image by Alexander Tewfik for WCS. Seized illegal fishing vessels in Belize have been found to be registered in Honduras, Guatemala and Mexico, Tewfik says, highlighting the need for international cooperation within the Nassau grouper’s home range. The origin of the ship from this most recent incident is, as yet, unknown. Management authorities in Belize are limited by a lack of appropriate equipment, stymieing their ability to enforce compliance among both local and interloping fishers. “[There is a] shortage of proper vessels that can handle open, rough ocean conditions as well as night operations, [adequate] fuel, and in some cases, needed security,” Tewfik says, adding that management activities are conducted by the country’s fisheries department, coast guard, and NGO rangers at some sites. WCS Belize and its partner organizations are working to monitor and conserve the Nassau grouper within Belizean waters, which hold some of the world’s few viable spawning aggregations. More than 40 years ago, Jacques Cousteau’s expedition filmed 15,000 Nassau groupers at Caye Glory Atoll. This year’s survey of the Northeast Point spawning aggregation, which once boasted similar numbers, recorded fewer than 400 of the fish. 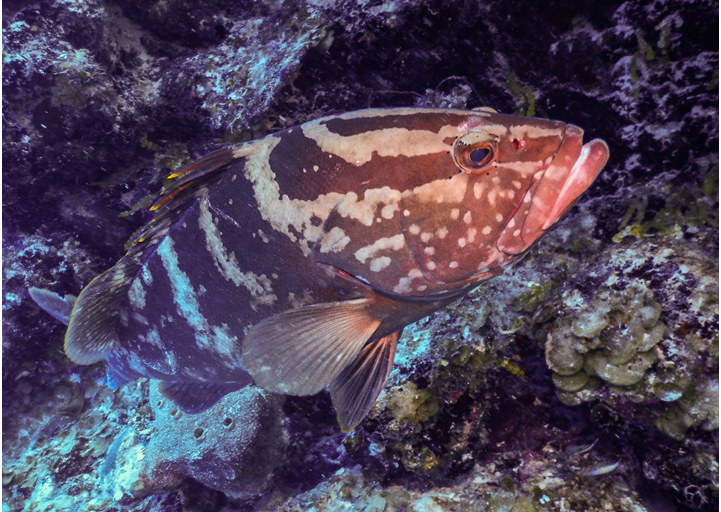 In response to the species’ growing scarcity, U.N. Environment’s Caribbean Environment Program added the Nassau grouper to Annex III of the Specially Protected Areas and Wildlife (SPAW) protocol in early 2017. This calls for special measures to ensure the Nassau grouper’s protection and recovery, and more stringent regulations governing its catch. But as with the Belizean fisheries, inadequate enforcement of the SPAW protocol regionally can be a limiting factor in the recovery of affected fisheries. In spite of dire population estimates and inadequate resources, conservationists are pressing forward with efforts to monitor and preserve the Nassau grouper. In addition to dive surveys to count fish, the WCS team uses an innovative laser-based technique to measure the lengths of individual fish without causing stress or injury. A pair of lasers, mounted beneath underwater cameras, are shot out at a known length, which researchers can then compare with photos of the fish. The proportions of different lengths of Nassau grouper individuals in a certain population tell scientists about the health and recovery of a spawning aggregation. 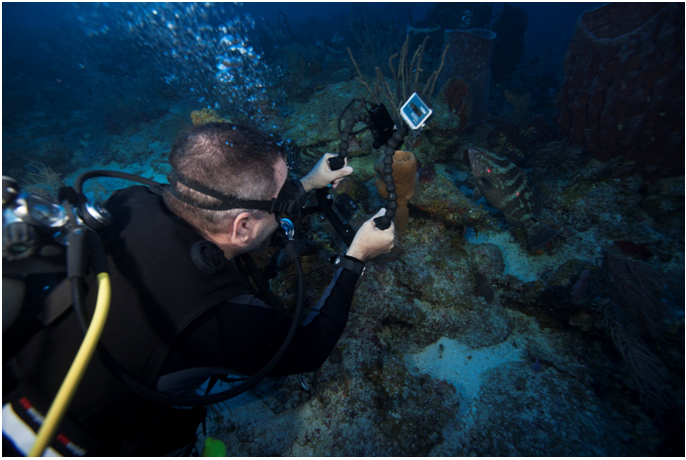 A diver measures an adult Nassau grouper using the innovative “laser caliper.” Image by Keith Ellenbogen. Tewfik says data on size is just as critical as that on abundance. The WCS team looks for the presence of mega spawners, groupers longer than 30 inches, or 76 centimeters. Researchers also hope to see higher numbers of smaller, younger fish, which indicates the population is recovering through successful spawning. WCS is also working to protect Nassau grouper habitats through its Replenishment Zones Program, supported by the government of Belize, the Nature Conservancy and other NGO partners. More than 7 percent of Belizean waters have been set aside for this program to date. The program integrates habitat protection with communication initiatives to teach fishers the benefits of keeping some marine areas protected. In Belize, management authorities use the term “replenishment zone” instead of the more widely used “marine protected area,” or MPA, to underscore the notion that these sites benefit fishers by providing a space where populations of their quarry can grow unmolested. Glover’s Reef Marine Preserve, which contains the Northeast Point spawning aggregation site, provides permanent refuge for fish species throughout the year. A mature Nassau group in its native reef habitat. Image by Alexander Tewfik for WCS. The WCS team has found that protected areas not only benefit the Nassau grouper but also help to protect less mobile sea creatures like the commercially valuable queen conch and spiny lobster. Nassau groupers, when caught legally, can still be consumed throughout much of the Caribbean. Consumers seeking to avoid eating a critically endangered species might have difficulty determining what fish to buy at a restaurant. “It would most likely just be called grouper,” Tewfik says. Local and regional fishers will need to comply with the protections, or risk seeing stocks of Nassau grouper vanish altogether. The spawning aggregations may never recover to the historic splendor of tens of thousands of swirling fish, but the work of scientists, conservationists and law-abiding fishers, along with the cooperation of governments around the Nassau grouper’s range, may yet save this species from total extinction. Heppell, S. A., Semmens, B. X., Archer, S. K., Pattengill-Semmens, C. V., Bush, P. G., McCoy, C. M., … & Johnson, B. C. (2012). Documenting recovery of a spawning aggregation through size frequency analysis from underwater laser calipers measurements. Biological Conservation, 155, 119-127. Tewfik, A., Babcock, E. A., Gibson, J., Perez, V. R. B., & Strindberg, S. (2017). Benefits of a replenishment zone revealed through trends in focal species at Glover’s Atoll, Belize. Marine Ecology Progress Series, 580, 37-56.